Website contributor Dave DuPree has found the following image and article in The Salt Lake Tribune from Saturday, November 26, 1932 (page 33). This is the article to which Dave referred in his comment on the Needle Peak video. Thanks, Dave! Man’s ancient beast of burden, the mule, has been having a busy week aiding in the construction of a beacon to make the most modern way of travel safer. Above is a Fort Douglas soldier leading a mule up Red Butte mountain bearing equipment for the airplane beacon on the mountain top. The other view shows Lieutenant Howard H. Reed directing the placing of the tower. Primitive methods of transportation have been used during the past week to make safer the most modern means of travel. 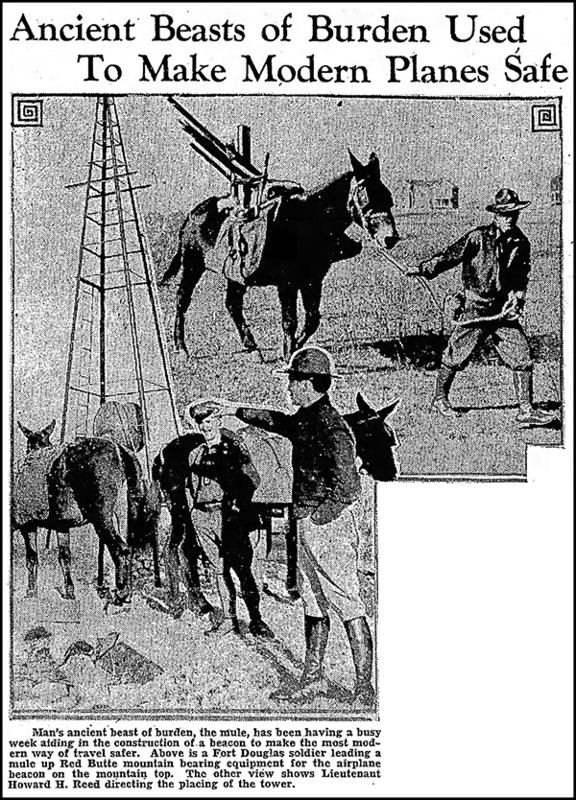 The lowly mule, used as a beast of burden since earliest times, has been kept busy so that the path of airplanes traveling across the continent may be made easier. With the adoption of the recent policy of the airways division of the United States department of commerce to replace beacon lights with equipment of more efficiency, Red Butte mountain for the past few days has been the scene of much mule travel. The animals loaned the division by the commanding officer at Fort Douglas have been employed to carry the new beacon to the mountain top, where it will replace the present one as a guide to pilots coming into Salt Lake valley from the east. W. E. Kline, in charge of the airways division office, has had charge of the work, which is expected to be completed Saturday or Monday. According to Mr. Kline, the new 36-inch beacon light will have a beam of 1,500,000 candlepower, or from 300,000 to 400,000 greater candlepower than the light now in use. He said the present construction is part of a plan to replace more important beacons with equipment of greater efficiency. Silly 1930s people- donkeys are hard to see at night, even in Utah. Ha-ha … hilarious and true! Thank you!